Luxury Antonovich Design has pioneered lots of impressive luxury interior design but the award-winning company doesn’t stop there. We also do modern elegant furniture that is top-notch and world-class. Some of our designs revolve around the most luxurious in the metro. In this article, you will find several unique designs that will surely suit your home’s interior design. Our couches come in shades of brown and cream. We created these designs that suit any type of living room interior design. Different shades of brown are utilized and the custom fabric that we used are made of intricate materials. Aside from its visual appeal, the processes involved in creating this masterpiece is extensive. From unique sketches to amazing master planning led by the company’s head, the couch turned into an amazing work of art despite its simplicity and modernism. The second couches have patterns that you will surely adore. Its checkered design is unique and the spacious design is surely adorable. 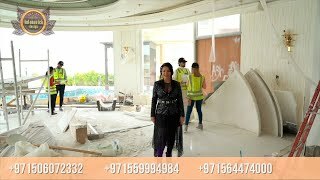 Being one of the best interior design company in the United Arab Emirates, it is very critical for us to release designs that are surely amazing. It is our commitment to give excellent designs and we promise to provide the best of the best in everything that we do; be it interior design, master planning, blueprints, fit-outs, and even furniture designs. In doing table and chair combinations, we examine the best techniques in order to provide excellent output. Wood and white pairings are always a classic and everyone will absolutely love its modern design. The four-legged open design of the chair is everyone’s cup of tea and its wood details are great. The chair will surely stand alone and it would easily go well even on any types of tables. The overall interior design is partnered with wooded cabinet finish with a chandelier that goes well with the color combination of the interior design. We really do love working in unique chairs and these designs are no exception. We created these stunning designs to make sure that our clients will love and adore its modern details. Wood is a classic but we gave it a contemporary touch to match the interior design of this room. Aside from doing excellent designs and having a vast portfolio of luxury furniture designs, we also provide instant and fast designs for any of your needs. Our free is luxury designs and we make sure that issues and problems if there is any, are worked instantly. At Luxury Antonovich Design, we produce modern elegant furniture designs.